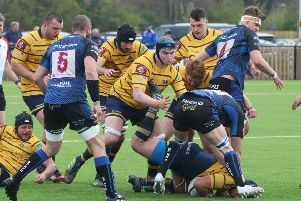 WORTHING Raiders head coach Kieron Dawson is hoping his side can salvage some pride when they host Henley Hawks in the National 2 South on Saturday. It’s been an indifferent start to the campaign for Raiders as they have won seven and lost seven of their opening 14 matches this year. And this Saturday will be the toughest test of the season for Dawson’s side as they host Henley, who are top with 14 wins from their 14 games this season. Dawson knows what dangers they pose but is hopeful his side can come out on top. He said: “We know it is going to be a really difficult test against Henley. “They are top of the table and have yet to drop a point this year. “But what this does is provide us with an ideal opportunity to show what we are about. After Saturday, Raiders then host second-placed Dorking the following week. Dawson continued: “It’s the two most difficult fixtures that we could have in the space of two weeks.